Call 800.262.8858 to place your special order. Acoustic Guitar reviews five acoustic-electric classical guitars with narrow necks from Alhambra, Córdoba, Hill, Martin, and Taylor. 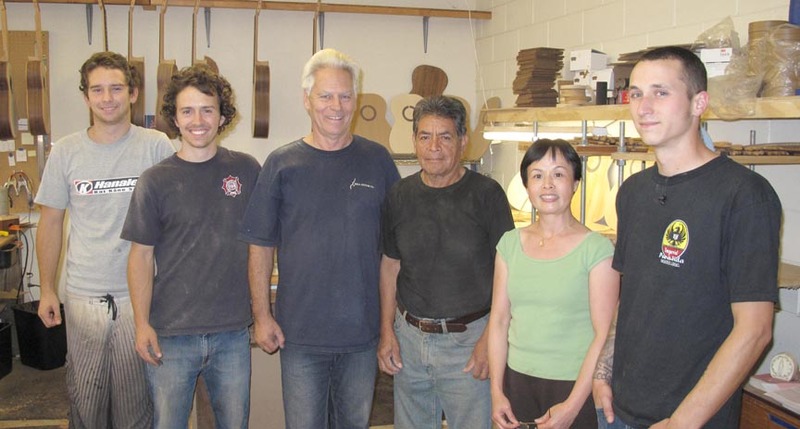 Headquartered in Ben Lomond, California, the Hill Guitar Co. operates under the guidance of luthier Kenny Hill, who has been building classical guitars since 1972. 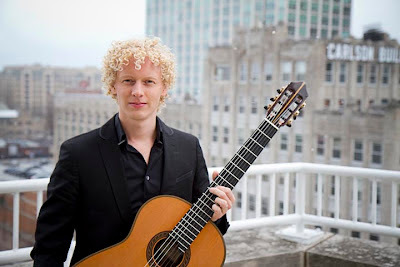 The company’s high-end classical guitars are highly regarded by serious classical players, but Hill also consults with Córdoba Guitars and has developed his own line of more affordable instruments that are built in China and sold under the New World Guitars name. 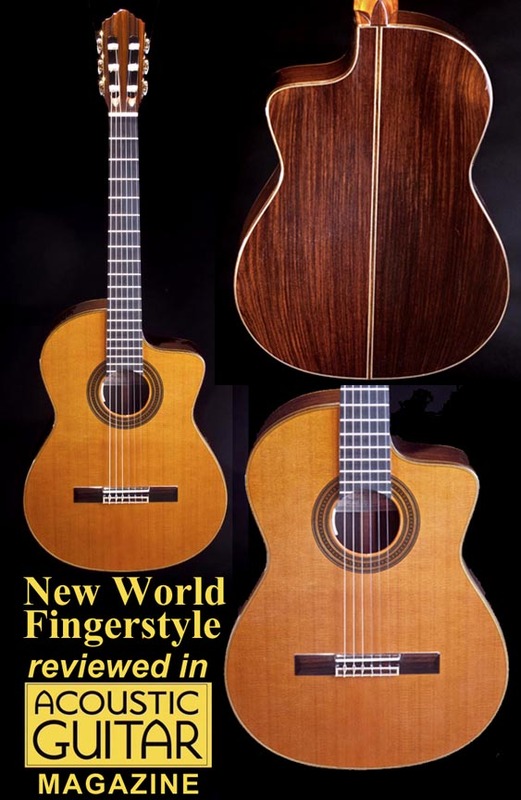 Our review guitar is a Fingerstyle-C model from the New World Players series. 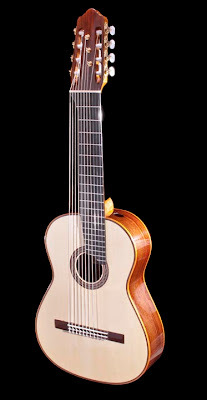 It has a 17⁄8-inch nut width and cutaway but has the overall look and rich, warm tone of a traditional classical guitar and is built with conventional classical construction techniques like fan bracing and a Spanish-foot neck joint. The high gloss finish, along with the dark cedar top, rich Indian rosewood back and sides, and understated look of the purfling and three-ringed rosette pattern creates an air of elegance. Our Fingerstyle-C came equipped with an optional L.R. Baggs Anthem SL Classical electronics package, which includes an undersaddle pickup, microphone, and onboard preamp with a crossover circuit (click here for our review of the Anthem system). 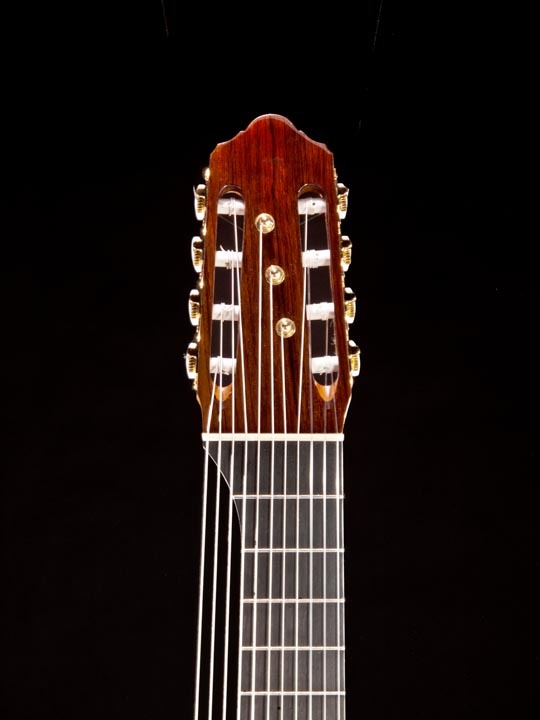 In contrast to other guitars in this article, the Anthem does not have controls in the side of the guitar (its volume control installs inside the soundhole). 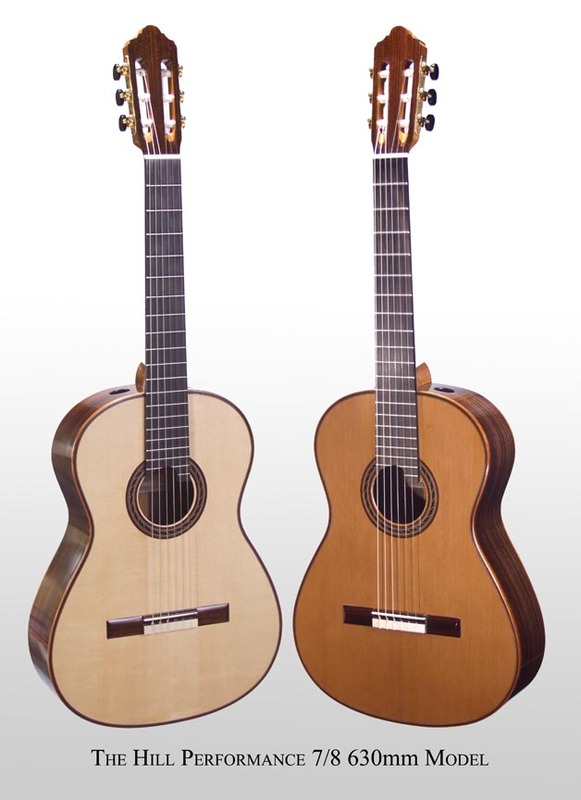 Both acoustically and amplified, the Hill Fingerstyle-C delivers the full-bodied tone one expects from a classical guitar, with a warm resonant midrange. The guitar is quite responsive and produces plenty of volume when played hard. I appreciated the combination of the very playable neck and warm traditional tone. 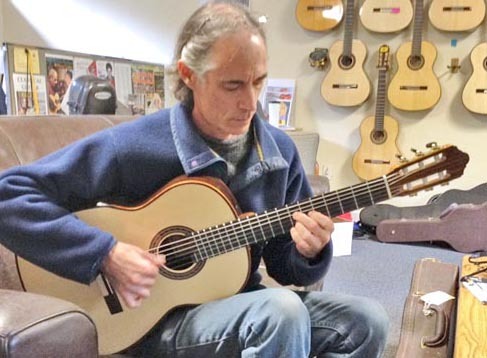 I was happy with the sound of traditional classical pieces as well as jazz and Latin tunes, and the guitar’s plugged-in sound was warm, full, and surprisingly feedback resistant. 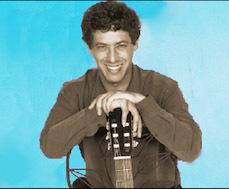 Fiore commented on the Fingerstyle- C’s dark tone and spent a lot of time exploring single-note melodies in the bass, as well as the wide range of tones created by varying his pickinghand position. SPECS: Solid cedar top. Solid Indian rosewood back and sides. 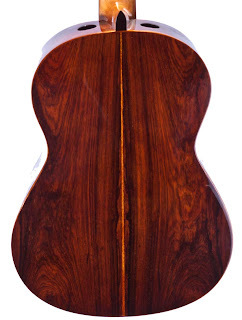 12-fret mahogany neck with Spanish-foot neck joint. Venetian cutaway. Ebony fingerboard. Rosewood bridge. Bone nut and saddle. 650-mm (25.59-inch) scale. 17⁄8-inch nut width. 21⁄4-inch string spacing at the saddle. L.R. Baggs Anthem SL Classical electronics. D’Addario Pro Arte strings. Made in China. 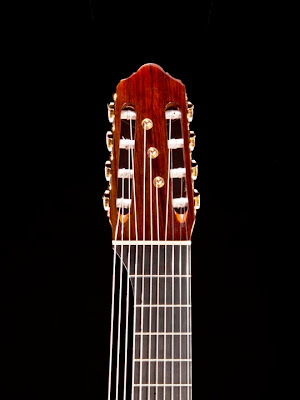 Left-handed version available without a cutaway. PRICE: $1,995 ($1,795 without electronics). MAKER: Hill Guitar Co.: (800) 262-8858 www.neworldguitar.com. In response to many Frequently Asked Questions, we've started to add specific information regarding the features and options on our guitars with hopes we'll provide a knowledge base for those interested. 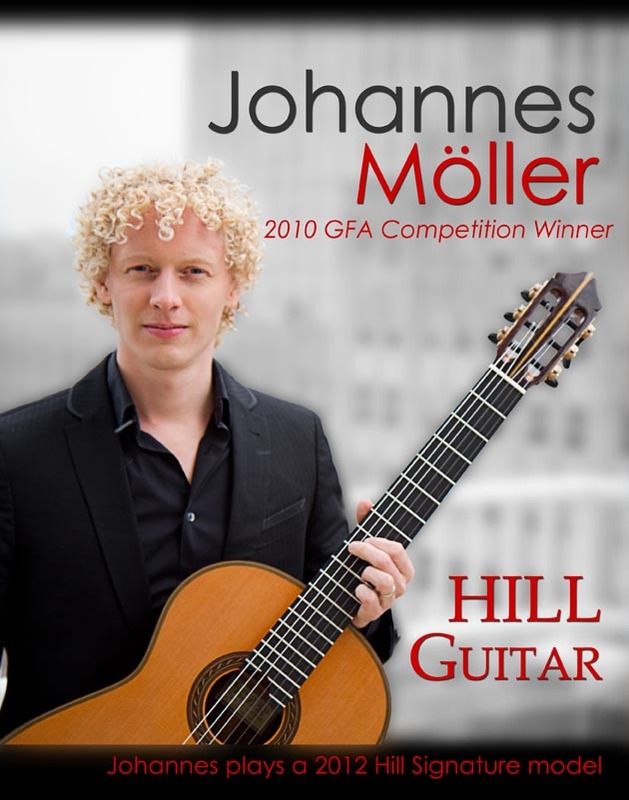 Kenny Hill states, "Johannes plays guitar in another realm. He uses the guitar with a delicate, sensitive, powerful touch. His own compositions carry a sincerity and emotional impact that is irresistible, and his approach to traditional classical repertoire is refreshing and inspiring, shaped by his own enhanced skills as a composer. His understanding of the fingerboard, the harmonic possibilities and the resonance of the instrument are truly unique and profound. He is a charismatic performer, and shares his love for the music in a way that is personal, compelling and elevating." Johannes plays a lovely cedar top Hill Signature Model guitar, made in 2011. Hill Guitar Company...another new era. 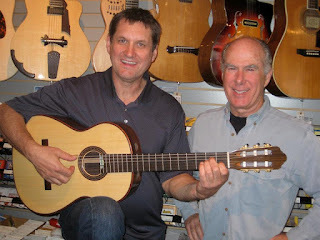 Hill Guitar Company is in yet another new era, maybe the best yet. My sons are both working in the company. I'm happy to say they are working hard to absorb our past and experience, and push forward to do more good work. At this time, Simon is assembling the guitars up to the bindings, and I am doing neck, fingerboard, frets, etc. Quillan is sanding and French polishing. But we are only part of the team. Francisco Hernandez has been with me for around 20 years, first in Mexico and now here in California. 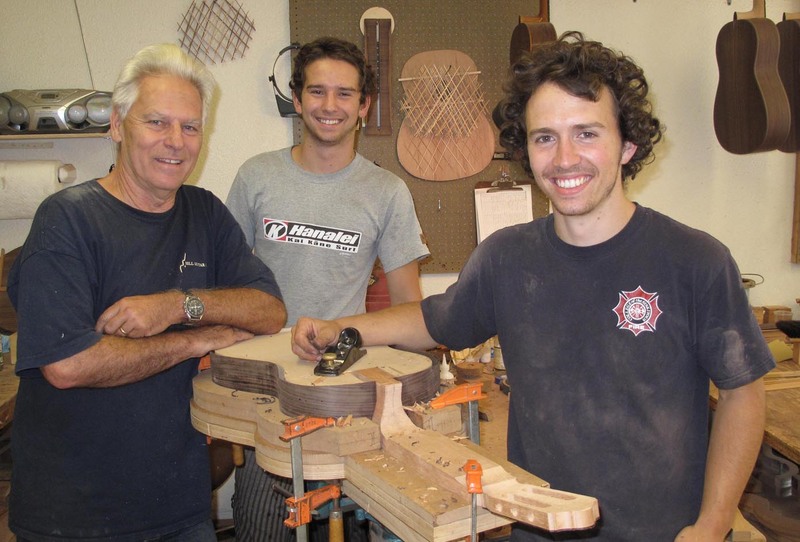 He is a great, great, guitar maker, and I can't imagine where we would be without him. He has been making guitars for over 60 years with great skill and patience. He is really from an old world, and a true treasure. 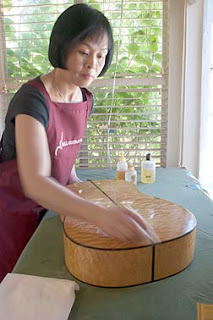 Haiying Jiang has been with us for many years doing French polish, and she is passing along the process. She is very, very good at this, generous in teaching. Haiying and Quillan are both doing French polish, a slow but happy finish process. 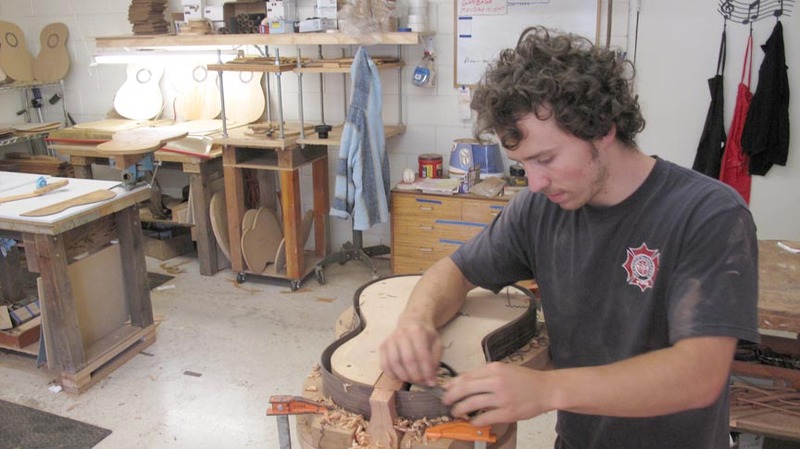 Ben Lamdin has been with us for about 5 years, doing bridges, finish buffing and set up and repairs. He's dedicated and he's good. He is the person that brings all the guitars to completion and perfection. Together we are making some of the best guitars ever, and with any luck, you'll get one! 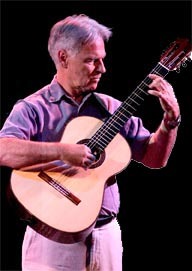 There are certain developments that are favoring some smaller guitars in the world; one is the remarkable number of child players who are becoming very accomplished at an early age, and another is the population of wise, experienced guitarists who long for instruments more comfortable and easier to play. Until now, in the guitar market, smaller has almost always been cheaper, and lower quality because it's perceived to be for young students who aren't so serious. 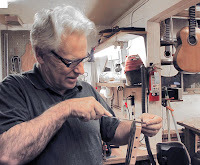 I've been working with shorter string lengths and smaller body guitars for a long time. Recently Scott Gossage a Teacher at Silicon Valley Classical Guitar School was in our showroom shopping with a talented young student, and while trying guitars he said "if only you had this size guitar but with this string length." What he said made sense to me, so I did it. I have taken our standard Performance Series and reduced the perimeter by 5mm all the way around, and built it with 630mm string length, and I love it. We are referring to the body size as 7/8, which is about right. 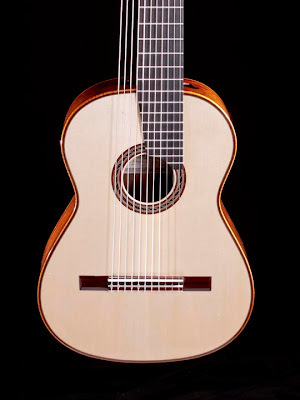 To me the lines of the body are just beautiful, the guitar feels wonderful and luxuriant, and it produces a full concert sound, and plays very easily. So far I have made two, one spruce, one cedar, but I have also made the molds for it, so this can be part of our regular production schedule, as time permits. This s a slightly smaller classical guitar, with full concert sound, featuring our unique Performance Series design including double top, lattice bracing, sound ports and French polish finish. It's priced the same as the standard Performance, and as such is a first class concert guitar at a modest professional price. I don't know of anything else like it anywhere. If you have ever wondered about something like this, well, this is it. You really deserve to try it. 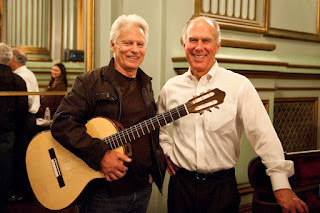 Want to hear how a particular Hill Guitar sounds??? "What does a Hill Guitar sound like?" 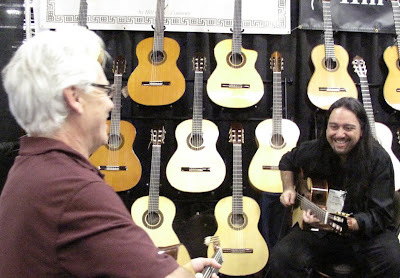 Now, after years of only being able to experience this amazing sound by walking into a Hill Dealer, or visiting our Showroom in the Santa Cruz Mountains, you can click here to check out video of Guitar Samples and updated Artist Samples! 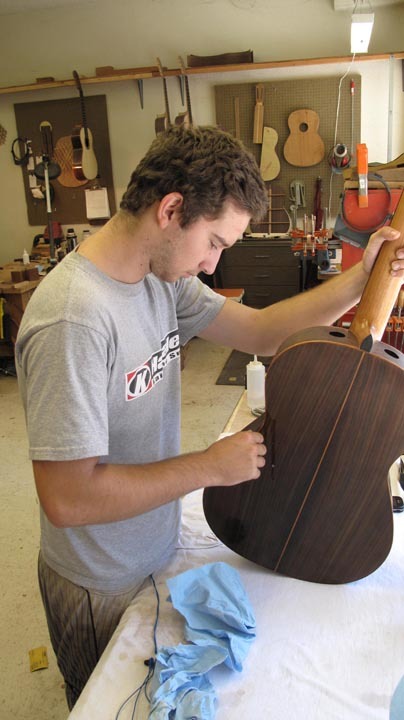 are our finest and most prestigious guitars, each one custom made to the highest standards of excellence. 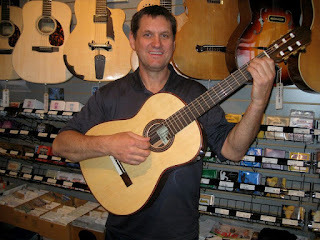 guitars are a lower priced line of instruments with features and qualities of the SIGNATURE series. Kenny was on hand in Dalian, China where this video of Huaicaong Mu playing Villa Lobos' Etude #7 was shot in June of 2012. Huaicaong Mu plays a Hill Signature model. This is one of several videos we'll be adding to our video cache on YouTube featuring musicians playing our instruments. The videos will also be available to browse on our website by guitar, and by artist as well.